May Week is a national program of Delta Sigma Theta Sorority, Inc. Since 1920, a week in May has been set aside for programs highlighting academic and professional achievements. The events emphasize the importance of higher education in the community, especially for black women. Kings Who Cook is Brooklyn Alumnae Chapter's incredibly popular tasting event showcasing the culinary expertise of the "Kings" in our community. Brooklyn Alumnae is back with our annual HBCU Fair! Learn how an estate plan can protect you. A discussion on the visionary James Baldwin, his legacy, and his influence on Hollywood. 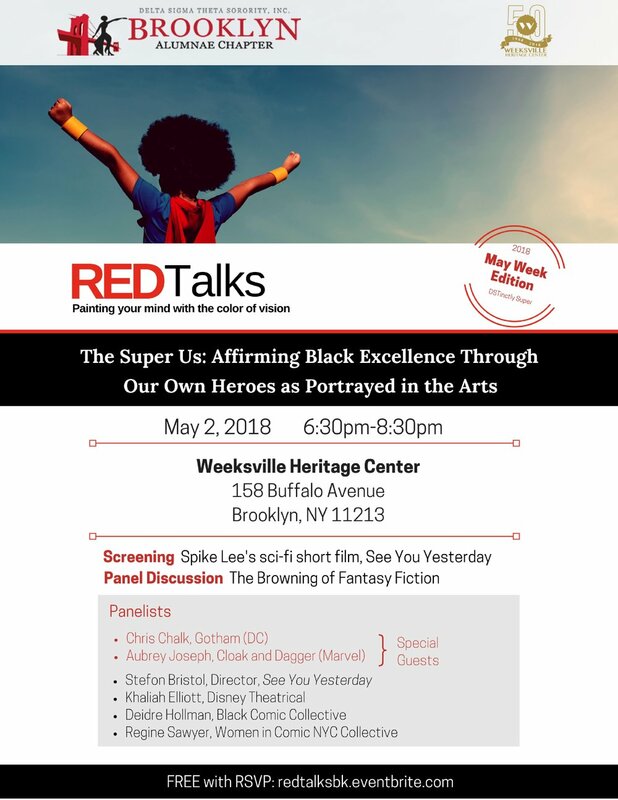 This FREE event is open to adults and children from the Brooklyn community and beyond, featuring a variety of activities including, but not limited to, a children’s reading corner, readings by participating authors, vendors, book signings, and more. Featuring a group discussion Isabel Allende's "Island Beneath the Sea," the Book of the Year pick by our International Awareness & Involvement and Arts & Letters Committees. Ida B. Wells, born into slavery in 1862 and freed by the Emancipation Proclamation, devoted her life to the fight against racism, sexism and anti-black violence. Hear her story. Support our team as we walk to help end breast cancer! Book Signing: "For Colored Girls Who Have Considered Politics"
Meet the authors and hear them read from this powerful and timely book. Free and open to all. Join us to view THE HATE U GIVE! Learn more about who is running to represent YOU at this nonpartisan candidate’s forum. Do a great thing by giving blood. Bring a friend! Food, fun, music and the gift of life. Join us for a springtime luncheon event where we will crown our 19th Miss Jabberwock! Each applicant may submit one original piece of artwork produced as a painting, a drawing, a mixed media picture, a computer-generated picture, or a photograph. First and second place winners will be awarded in each grade category. Each student who submits a work of art will receive a certificate of participation. First and second place winning works will be displayed on the chapter website. Work must be photographed and submitted online via BROOKLYNALUMNAEDST.ORG/EVENTS-1/VISUALARTS. It is recommended that work be shot with a point-and-shoot camera or a DSLR camera. Camera phones are not recommended. A completed Student Entry Form must accompany the uploaded artwork. Additionally, a signed parental permission slip will be requested before the winning work can be posted on the chapter’s website. Works must be submitted by midnight on April 30th, 2018. The 2018 contest will be conducted exclusively online. 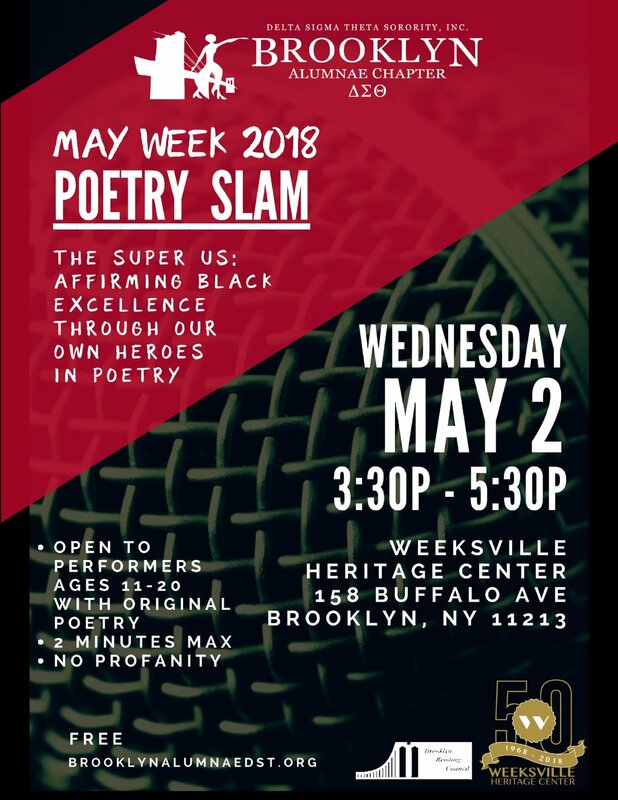 Beginning on May 2nd, 2018 at the May Week Program at Weeksville Heritage Center, student work will be viewed and voting will begin. Viewing and voting will end at noon on Friday, May 4th, 2018 after which winners will be posted. Must sign in to Google to upload. If you do not have a Google account, you may email your file to artsandletters@brooklynalumnaedst.org. Annual tasting event and culinary showcase featuring the KINGS of Brooklyn and their best dishes! Join us as we gather to watch the most anticipated film of the year, Black Panther! Ride with the Brooklyn Alumnae Chapter to the NYS Association of Black and Puerto Rican Legislators, Inc.'s 47th Annual Weekend Conference. Join us to celebrate American Heart Month and learn how to put heart health first. A party and tasting event in time for the holiday season.